John M. Perez.Com: Is Selling Premium Support Increasing In Popularity? Is Selling Premium Support Increasing In Popularity? Is Selling Premium Customer Service & Support for your company increasing in popularity? A recent study by The Service & Support Professionals Association reveals that the popularity in customers purchasing added value support has not increased by much. Over the last five years there has been a slight increase in the percentage of premiere contracts, from 16% in 2003 to 21% today. But the lion’s share (71% vs. 68%) of customers continue to go for the no-frills basic maintenance agreement. 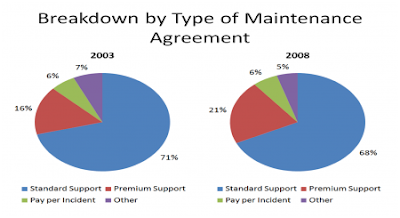 In addition, it looks like maintenance contracts with Standard support is decreasing going from 71% in 2003 to 68% in 2008.